JUST PAINT IT ON Colourfix Primer – a fine tooth quick drying liquid primer which bonds aggressively to practically any clean non-greasy surface. Suitable for paper, canvas, card, ply, timber, masonry, terracotta (bisque fired) pots. For metal, glass and other non-absorbent surfaces allow Colourfix to cure and harden. NON-TOXIC, ACRYLIC BASED, 16 LIGHTFAST ACID FREE COLOURS (PLUS CLEAR), QUICK DRYING,TOUGH FLEXIBLE FINISH, WATERPROOF WHEN DRY, CLEAN UP WITH WATER . ALL COLOURS ARE AVAILABLE IN 250ML POTS. Rich Beige, Sand, Soft Umber, Storm Blue, Aubergine, Blue Haze, Burgundy, Fresh Grey, Leaf Green Dark, Rose Grey, Deep Black, Elephant, Deep Ultra Blue, Terracotta, Burnt Umber, White, Clear. Black, White and Clear are also available in 1 litre tubs. Painting with Colourfix Primer - Application Primer can be layered, dabbed with a brush or sponge, scraped on, textured or painted out to a smooth fine surface using a Colour Shaper Wide, a range of rollers or brushes (the finer the brush, the smoother the finish). Choose any of the 16 colours for a dense one colour ground. Colourfix Primer Colours can be tinted with Art Spectrum Inks, Gouache, or acrylic for new colour combinations. White and Clear are particularly successful. 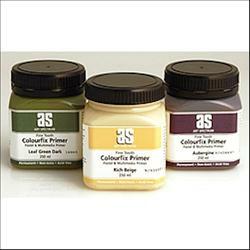 Primer can also be intermixed to create many new colours. Clear Colourfix Primer allows the original art work or surface to remain visible and at the same time creating a tough multi-use surface. Glossy magazine and other printed material can be overpainted to create a receptive surface for a wide range of media. Transparent films of delicate subtle colours are possible with tinted Clear Primer painted over natural or coloured surfaces Colourfix Paper or existing art work. White mixed with other Colourfix Primer colours will create many opaque pastel shades to paint with. White (or coloured) primer is an excellent cover or touch up paint for a variety of media. It dries quickly with a matt finish. Once dry, further painting or drawing can commence. The surface will take repeated erasure. This is particularly useful when working with compressed and natural charcoal, graphite, coloured pencils and pastels. (See brochure “Techniques for Removing Pastel from Art Spectrum Colourfix Papers). Colourfix Primer can also be applied as a final decorative finish to a wide range of surfaces. Its fine tooth and opaque qualities allows Colourfix Primer to dry with an ultra-matt finish. Collages – Because of its strong bonding qualities, Colourfix Primer is a good adhesive for all types of materials. Cloth, canvas, paper, rubber, plastic and other objects can be embedded in a wet coat of Colourfix. Individual items can be coated and glued onto papers, cardboard, plywood or other similar porous surfaces. As well as being an adhesive, (use or mix any of the 16 colours to suit the collage), Colourfix Primer is also a surface to paint and draw on. These attributes are particularly useful for 3D, architectural and sculptural forms made from cardboard, and other assorted materials. Colours and Media Art Spectrum Gouache, Watercolours, Soft Pastels, Inks, Oil Pastels, charcoal, coloured pencils, graphite, acrylics and other media can be used on a Colourfix surface. Experimentation is worthwhile. There may be something no one has thought about yet. When you have an unsatisfactory or unworkable surface you must use, with a colour or medium you need to use, then Colourfix Primer could be the answer. Art Spectrum Oil Primer 500 ml.